With spring just around the corner, it’s time to start thinking about renewing those rooms in your home that are looking a bit tired. Why not start with the kids’ bedrooms? At B&M we have some amazing kids’ furniture ranges that not only look great but act as great space-savers. Perfect for keeping piles of toys out of sight! Ideal for little hands to put down their big ideas, our Mobel Kids Wooden Table + 2 Stools set is perfect for kids who love to draw, write and release their creativity. Our Mobel Wooden Bench and Wooden Chairs make great additions and can be pulled out for kids’ parties (even if you’re the one who ends up sat on them!). What’s more, they look super cute next to the Toy Storage Cabinet and Toy Storage Chest. A real lifesaver when it comes to hiding mountains of toys! B&M Top Tip: if you're really struggling for space, you can stack the Toy Storage Chest and Storage Cabinet on top of each other! For a bit of colour in kids’ bedrooms, you can’t go wrong with our Crayola range of kids’ furniture. 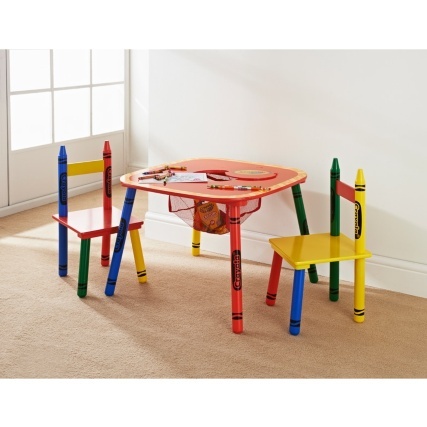 The legs on this adorable Table & Chairs 3pc set are oversized Crayola pencils. How cute!? And you can kit their room out in matching furniture, from 1-2-3 Shelving Units and 6 Cube Shelves, to the 3 Shelf Bookcase and lots more toy storage solutions to boot. If your little princess is after a splash of pink in her bedroom, look no further than the Amelia range of kids’ furniture. Our Amelia Vanity Set includes a mirror, drawer and stool, making it easy to get ready for school with everything they need all in one place. Combine with matching Amelia Bedside Cabinet, Bookcase and Velvet Kids Chair for a makeover that’s fit for a princess! And if you’re really struggling for space, then you can’t do much better than the Clifton Kids Cabin Bed. Featuring handy shelves and hidden cupboards; toys, books and other bits and bobs can be stored away for easy access for when playtime comes round again. For something for older kids and pre-teens, the Arabella Day Bed will help ‘glam up’ bedrooms and still leave space for storage underneath. Show us your own transformations! If you’ve bought any of the furniture featured in this blog, we want to see what you’ve done with them. Share your photos on Facebook, Twitter & Instagram.